Edited with Annotations by Mark Hemry and Jack Fritscher, Ph.D.
As a courtesy to readers and researchers, the complete written text of this history book, including graphics captions, is posted as a free pdf minus the graphics themselves appearing only in the trade paperback edition. The entire Volume 1 in a searchable pdf (minus graphics). Note: the file is 7+MB. The Father of Gay Writing, Sam Steward (Phil Andros) Ph.D., warned me I'd end up like this: both subject and object. As founding San Francisco editor in chief of Drummer and the writer most published in its pages during its 25-year life, I have to list my writing and photography both as historical objects of the period, and myself not only as an historical participant who lived as a gonzo journalist, but also as an historian university-trained to comment on literature and popular culture, precisely because the very lifestyles and art genres that I wrote about in Drummer--fiction, nonfiction, interviews, photography, film, and video --are the very tributaries that created what has come to be known as "gay culture." Historically, "magazine-culture" contributed real DNA into "gay culture" the way that "internet culture" is now defining "gay culture." I arrived at Drummer in 1977 with more than 20-years of magazine experience, and I took the opportunity to make the magazine reader-reflexive: what I put in its pages -- that I made purposely "self-conscious" -- was what was actually happening in the scene, both early on in the Golden Age of Gay Liberation in the "Titanic 70s," and later on in the desperate 80s and 90s. Ten years before I became editor of Drummer, I was one of the founding university members of the American Popular Culture Association, so I knew the importance of examing life unfolding at the moment it was unfolding, because pop culture as an intellectual discipline does not wait fifty years to make historical comment. To seal this deal at Drummer, I began to print on its masthead on the title page "The American Journal of Gay Popular Culture." 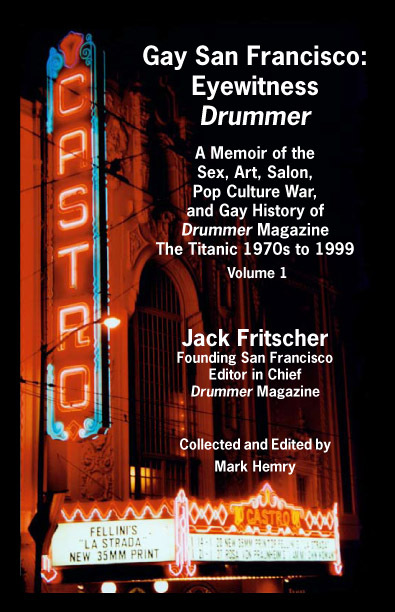 My secondary goal as editor and writer at Drummer was for masculine-identified gay men to be able to read about themselves, see photos and drawings of themselves, and develop a sense of international community of themselves as red-blooded males. My primary goal was to get the readers "off" erotically. Drummer, for all that legend has made it as an historical record and cultural force, was meant to be recreational entertainment back when people still knew how to read with one hand. Please enjoy cruising around in my Drummer documents. If you were there at the party that went on from 1975-1999 with Drummer, then this will be a trip down Memory Lane. If you missed the party of -- especially -- the 70s, you can fantasize how hot gay life once burned before viruses and politics and religion repackaged homosexuality. Research note regarding quotation, format, and use of this copyrighted information from both Drummer and this website. Editor's Note regarding these pages of gay history: If you are mentioned in these pages, or if you are an eyewitness to this history, you may correct or add to this book's editions by contacting Mark Hemry.